Parents with school and university age children can make the Democrat-endorsed ‘Green New Deal’ a prime opportunity for a teachable moment, to turn the tables on socialists running amok in Congress. Children can be taught at home what they’re never taught in class that socialism kills human souls and human hope, that it has a proven track record of bankrupting entire nations leaving their populations to starve. Lessons need not be long, but short and to the point, backed up by unfailing repetition. 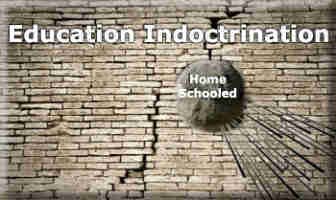 Parents can boost their children over the wall of indoctrination, long ago made impregnable by what is entrenched in the Public School System. The wall no one’s talking about is the one that was built to keep younger generations from ever coming upon the truth in the classrooms of our day. Students from kindergarten on are being taught that America and the capitalist system are evil and kept from the truth that Socialism Kills. Teach children that while their parents and grandparents may have lived a life of freedom, they are destined to live out their lives in socialist misery if the Democrats get their way. Ask them how they feel about living in a world where all commercial air travel is banned; how the Green New Deal will have removed all vehicles from the road by the time they graduate. As Arkansas Republican Senator Tom Cotton is warning, the Dems will “confiscate every privately owned vehicle in America within a decade and ban air travel so we could all drive or ride around on high-speed light rail supposedly powered by unicorn tears”.